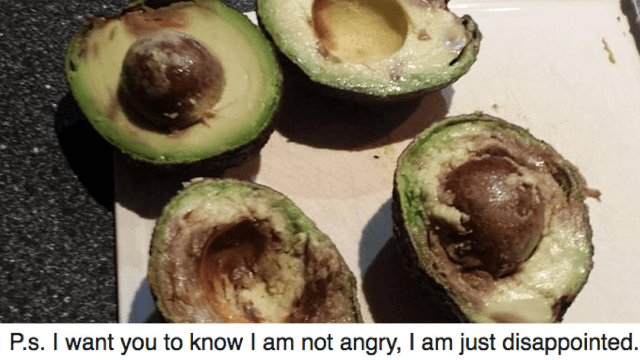 Woman tries a scam for free avocados, gets shut down by Woolworths and so many trolls. 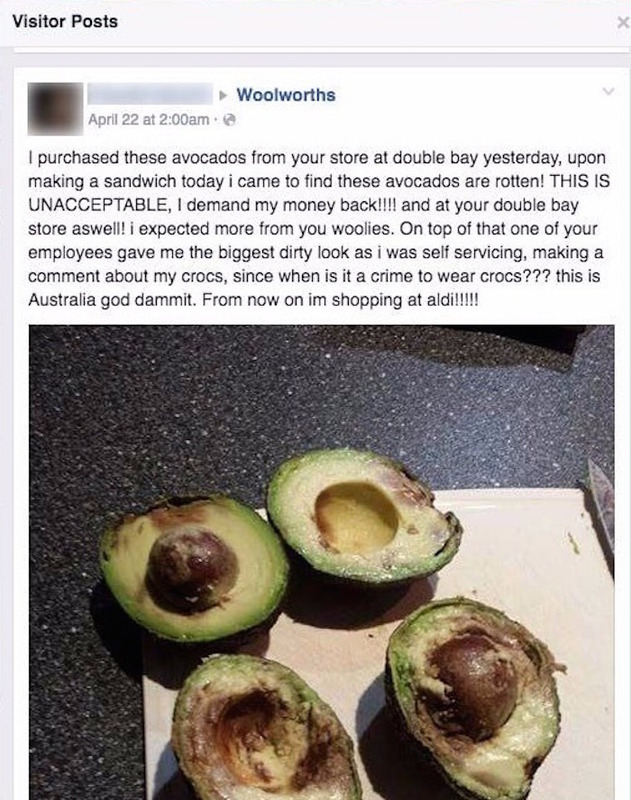 A very stupid scam artist reportedly tried to get money out of the Australian grocery chain Woolworths, posting a picture of her rotten avocados on their Facebook page along side a message where she demanded to be reimbursed. The only problem is this—she just stole a picture that had already been posted on the same page about two years earlier. Which is just about the laziest attempt at a scam of all time. Ah, and it seemed like the perfect crime! Too bad, scammer. I purchased these avocados from your store at double bay yesterday, upon making a sandwich today i came to find these avocados are rotten! THIS IS UNACCEPTABLE, I demand my money back!!!! and at your double bay store aswell! i expected more from you woolies. On top of that one of your employees game me the biggest dirty look as i was self servicing, making a comment about my crocs, since when is it a crime to wear crocks??? this is Australia god dammit. From now on im shopping at aldi!!!!! Surely there are some holes in this story. You need two whole avocados to make one sandwich? 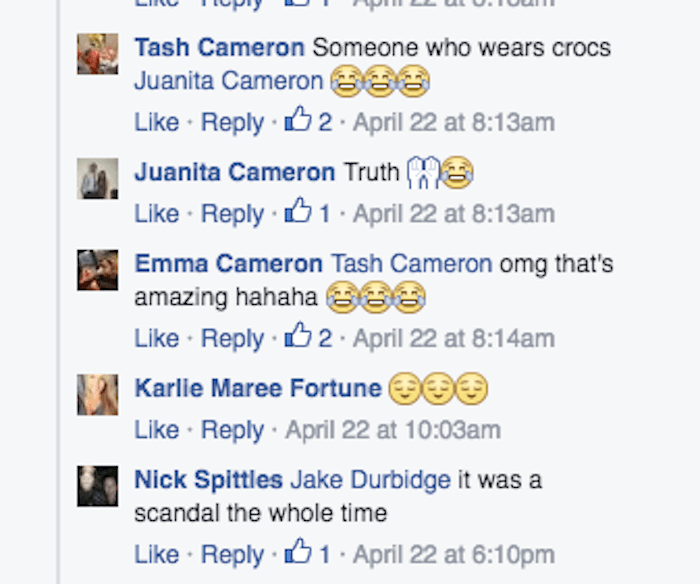 Someone out there actually thinks it's not a crime to wear crocs? 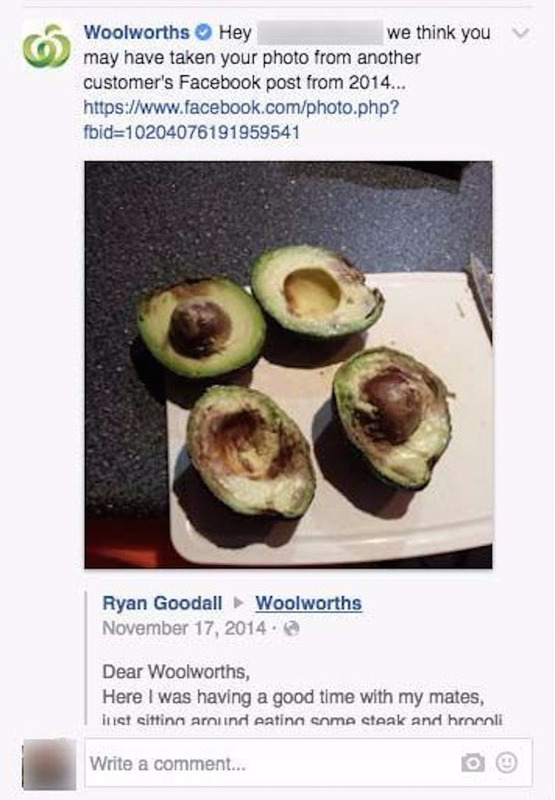 Yep, the original avocado picture was posted back in 2014 by a Woolworth's customer named Ryan Goodall. Goodall posted the picture along with a lighthearted message telling Woolworths that he is not angry, just disappointed. And for the record, Woolworths was really cool when they responded to Ryan about his disappointing avocados. So now the scammer was caught red handed. 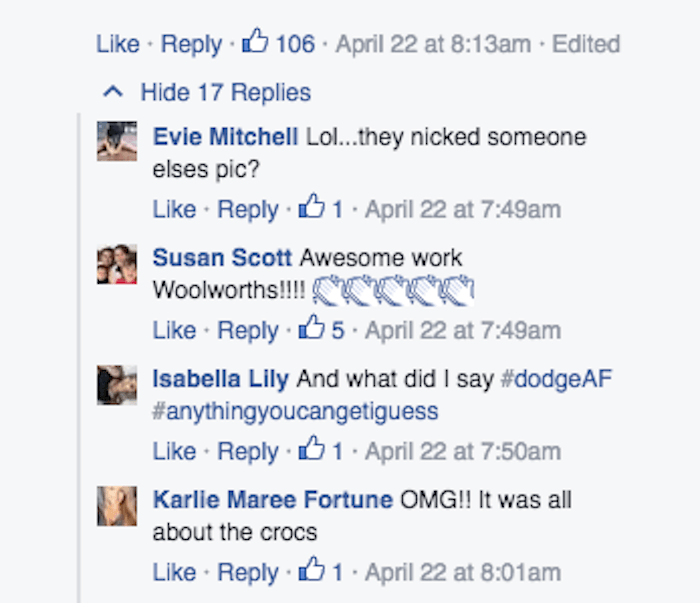 In what may have been a revenge plot motivated by the hate she received for wearing crocs, or maybe an elaborate scheme to get free avocados (those things are expensive), she was caught in a lie, and the internet had a field day in the comments section of the post. As if that were not enough to want to make the scammer want to crawl into a hole and live out her remaining days away from the public scrutiny of the Internet, people used the very picture she tried to steal to troll her. Hard. Realistically, if this woman got away with it, she probably would have only gotten about five bucks back. Which isn't even enough money to treat all those sick burns she received from Internet trolls.